Cancellation 60 days before the arrival date - 100% of total rental amount will be refunded. Cancellation 30 days before the arrival date - 50% of total rental amount will be refunded. Cancellation 20 days before the arrival date - 20% of total rental amount will be refunded. Cancellation 10 days before the arrival date - 10% of total rental amount will be refunded. If guests cancel less than 10 days or no show - total amount of stay will be charged. Partial cancellation during stay - total amount of stay will be charged. The Enchanted Garden is centrally situated, which makes it the perfect spot for you to drop anchor. We are a 30 minute drive from Cape Town city centre and the V&A Waterfront. The V&A Waterfront is known for it's shopping, dining and entertainment. From here you can also enjoy the sweeping views of the Atlantic Ocean, Table Bay Harbour, The City of Cape Town and Table Mountain. Here in Noordhoek we are about 3km’s from the stunning Noordhoek Beach where you can enjoy a leisurely walk, surf or go horse riding. Just a few Kilometers away is the Longbeach Shopping Mall, and a larger second Shopping Mall with a Virgin Active Gym. Nearby is the Noordhoek Farm Village and Cape Point Vineyards where you can enjoy the food market, picnics and wine tasting. We are a 20 minute drive away from Kirstenbosch Botanical Gardens. This is the most beautiful garden in Africa. To complete your visit to Cape Town, you must take a stroll through this garden. We are a 30 minute drive from the famous Table Mountain. You can hike or take the cableway to the top of the mountain from where you can enjoy the finest views of the Mother City. We are 20 minutes away from Constantia Valley with its superb wine estates which will offer you a memorable wine tasting experience with their award winning wines. 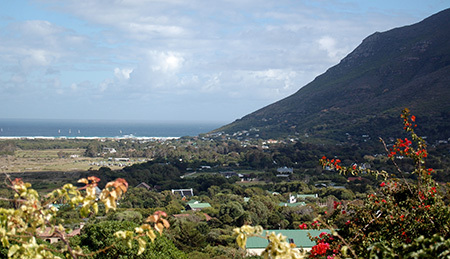 We are 15 minutes away from Boulders Beach. This beach is famous for its colony of African penguins. You can view the penguins at close range and enjoy a swim at this lovely sheltered beach. We are a 25 minute drive from Cape Point Nature Reserve. This is a must see destination. It offers spectacular sightseeing. It is known for its rich, varied and utterly unique fauna and flora. It is home to an array of fynbos, baboons, Cape zebra and over 250 species of birds.